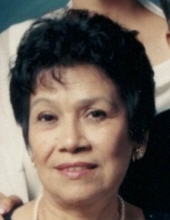 Maria Teresa Alvarez, nee Juarez, age 85, passed away peacefully on April 6, 2019 surrounded by her loving family. Maria was the beloved wife of Pablo for 63 years; loving mother of Robert, Paul, Raul (Veronica), Rosa and the late Ricardo and Mario Alvarez; cherished grandmother of Paul, David (Stephenie), Kathryn (Jacob), Brandon, and Michael; great grandmother of Tavin, Payton, Casen, Joshua, Desirey and the late Tyler; great great grandmother of Adonis; dear sister and fond aunt of many. Visitation Wednesday from 3:00 p.m. until 9:00 p.m. at Cumberland Chapels 8300 W. Lawrence Ave., Norridge, IL. Funeral services will begin at 10:00 a.m. on Thursday, at the funeral home, and we will then proceed to Our Lady, Mother of the Church for Mass at 11:00 a.m. Interment will follow at Maryhill Cemetery. For more information call 708-456-8300. To send flowers or a remembrance gift to the family of Maria Teresa Alvarez, please visit our Tribute Store. "Email Address" would like to share the life celebration of Maria Teresa Alvarez. Click on the "link" to go to share a favorite memory or leave a condolence message for the family.